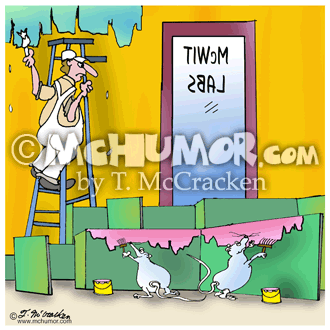 Painting Cartoon 5656: Someone painting an office accidentally knocks a can of paint on a man who's working at a desk. 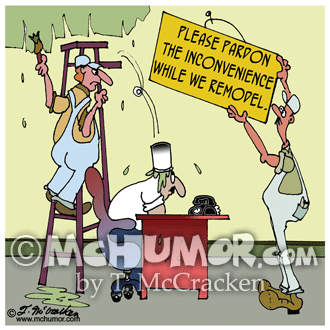 Another hangs a sign that says, "Please pardon the inconvenience while we remodel." 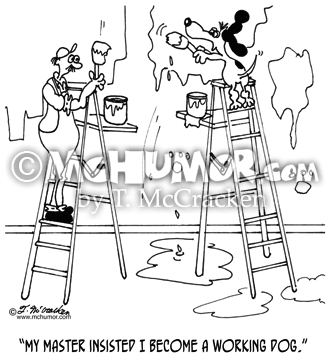 Dog Cartoon 6326: A dog working as a very sloppy house painter says, "My master insisted I become a working dog." 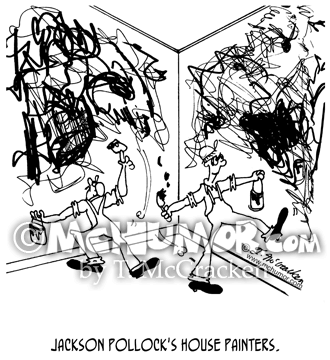 Painting Cartoon 6348: "Jackson Pollock's House Painters." 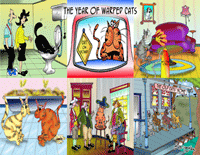 Painters throw splotches of paint on walls. 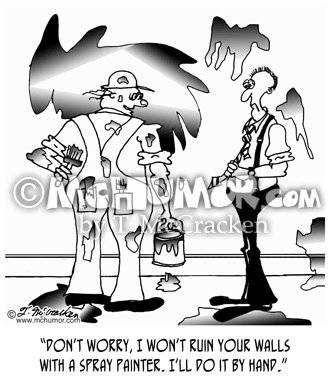 Painting cartoon 6102: A painter with a mess behind him saying, "Don't worry, I won't ruin your walls with a spray painter. I'll do it by hand." 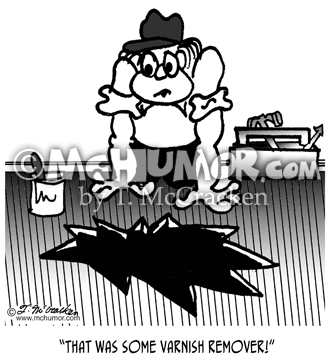 Interior Design Cartoon 6122: A carpenter looking at a huge hole in the floor saying, "That was some varnish remover!" 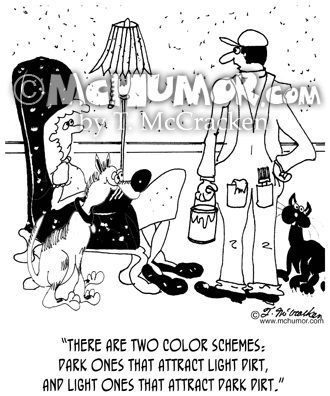 Interior Design Cartoon 6941: An interior designer saying, "There are two color schemes: dark ones that attract light dirt, and light ones that attract dark dirt." 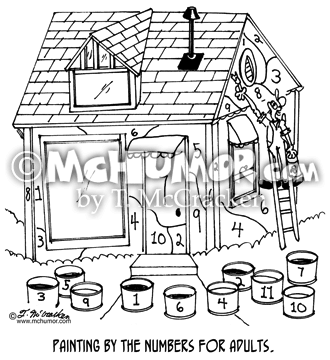 Painting Cartoon 6443: "Painting by the numbers for adults." A house has numbers written all over it just like those art painting kits do. 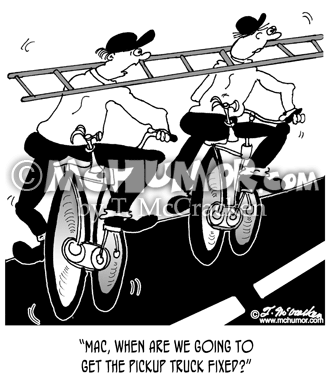 Power Washer Cartoon 6414: A painter using a power washer blows a hole in the wall and says, "Ooops. 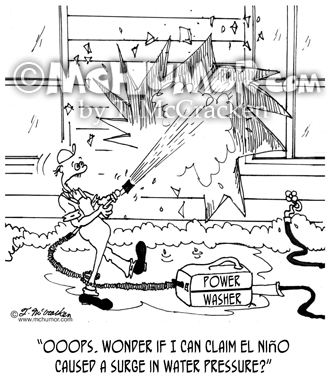 Wonder if I can claim El Niño caused a surge in water pressure?"